Today I’m treating you all to a printable which will come in very handy in the blogging world. 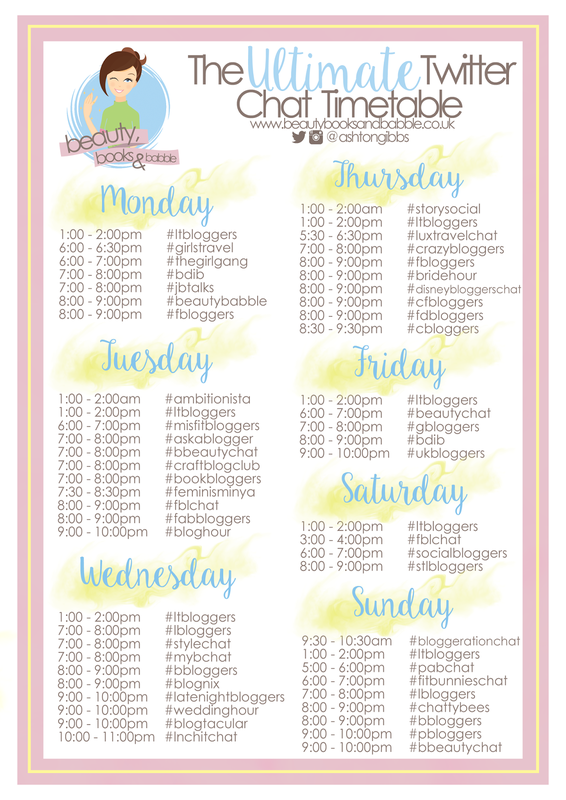 Maybe I’m tooting my own horn a bit when I call this timetable the ultimate timetable, but I have spent quite a lot of time not only trying to find every chat I can, but also going through numerous hashtags, old and new, to find out which chats are still active in the Twittersphere. A Twitter chat is basically one huge public conversation between whoever wants to join in on the world of Twitter. They are usually scheduled at specific weekly times so that everyone knows when to join in. Each chat is focussed around one unique hashtag which allows you to follow the discussion and participate if you wish, and types of chat can vary from beauty to books to movies to careers to periods (sorry guys). Twitter chats are great for being introduced to and building connections with other bloggers, and sometimes businesses too. You’ll also probably find yourself learning something new or coming across some useful resources along the way too. They also make it incredibly easy to come across new blogs to read in the areas that you enjoy or in similar situations to yourself. For example, you can take part in a #cbloggers chat to immerse yourself in a discussion with plenty of creative bloggers, or you could participate in a #pbloggers chat to find out what other parent bloggers are getting up to. Putting website traffic and blogging to one side, they’re also great fun! You can meet some awesome people – I’ve personally made some awesome blogger friends from chats – and get stuff off your chest. You’ll sometimes come across a personal topic in a chat and you can use the opportunity to gather opinions, relate to others, and ultimately feel better about yourself and your blog. Do you take part in Twitter chats when you have the time? I would love to hear some feedback on this if you use it. Has it come in handy for you?